Nokia just announced their Q3 results and as expected, the quarter was a complete train wreck. The results showed that Nokia shipped just 2.9 million Lumia smartphones in the quarter. While the revenue & EPS narrowly beat analyst estimates, Nokia reported its sixth consecutive quarterly loss and continued to burn cash. Let's take a look at a few metrics to judge the performance of Nokia's Windows Phone strategy. As I expected, shipments of Nokia's Lumia portfolio crashed after the announcement of Windows Phone 8. Shipments of Symbian/Meego based smartphones continued their decline as well, giving Nokia a total of just 6.3 million smartphones shipped in the quarter. Falling demand for legacy operating systems is to be expected, but by now it is also clear that the Lumia range is just not gaining any traction in the market. The new WP8 based Lumia devices should give Nokia a temporary boost in Q4, but shipments in following quarters should continue to be weak. Low-end Lumia devices may still see some demand, but with Nokia's current strategy, it won't be enough to save the company. Surprisingly, Nokia's smartphone portfolio saw an ASP boost thanks to Symbian/Meego devices, but the Lumia portfolio continued its slide. While Nokia claims that the Lumia's ASP decline was due planned price cuts after the announcement of Windows Phone 8, it was just part of the reason. The Lumia's ASP has continued to fall due to weak demand and a shift in the product mix towards lower priced devices. With the new WP8-based Lumia 920 & Lumia 820 due to launch in Q4, at questionably high prices, we can expect to see a slight bump in the Lumia's ASP next quarter. However, this is likely to be short-lived and we should see the Q1-Q3 ASP pattern repeat itself over the next few quarters. Nokia's Asha portfolio seems to have helped it hold on in the feature phone market, as quarterly shipment volumes were up with flat ASPs. 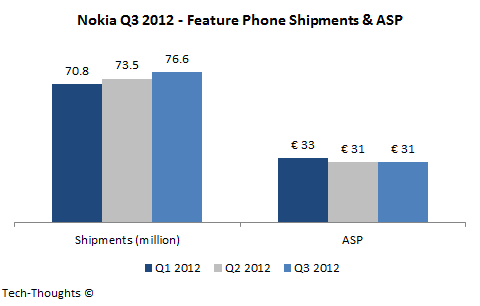 However, flat ASPs are a small consolation when Nokia's focus was on the new smartphone-like Asha range. In fact some of those devices were even classified as smartphones by research firms like Gartner & IDC. But these "tweener" models couldn't boost Nokia's ASPs because of continued competitive pressure from low priced Android handsets. As I predicted last quarter, Nokia's gross margin for the "Smart Devices" segment was even worse than Q2, even though inventory allowances were far lower. Their gross margin on feature phones remained stable, but continued to slip thanks to competitive pressure. The significant year-on-year decline in our Smart Devices gross margin in the third quarter 2012 was primarily due to the recognition of approximately EUR 120 million of allowances related to excess component inventory, future purchase commitments and an inventory revaluation related to our current Lumia products, as well as greater price erosion than cost erosion and higher fixed costs per unit, because of lower sales volumes. From an operating system perspective, the year-on-year decline in our Smart Devices gross margin in the third quarter 2012 was primarily due to a lower Symbian gross margin. On a sequential basis, the decline in our Smart Devices gross margin in the third quarter 2012 was primarily due to higher fixed costs per unit, because of lower sales volumes, as well as greater price erosion than cost erosion. The EUR 120 million of allowances noted above also adversely affected our Smart Devices gross margin in the third quarter 2012, but to a lesser extent than the EUR 220 million of such allowances in the second quarter 2012. As I expected, the allowances for future purchases were lower in Q3, as compared to Q2. The inventory revaluation clearly hints at continued lackluster demand for the Lumia range. Inventory revaluation occurred in Q2 as well, so it cannot purely be attributed to WP8. From an operating system perspective, the sequential decline in our Smart Devices gross margin in the third quarter was primarily due to a lower Lumia gross margin, partially offset by a higher Symbian gross margin. 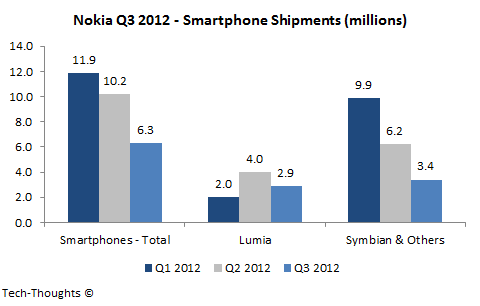 In addition sales of Lumia products which were not available in the third quarter 2011 had a lower gross margin in the third quarter 2012 than Symbian devices in the third quarter 2011. 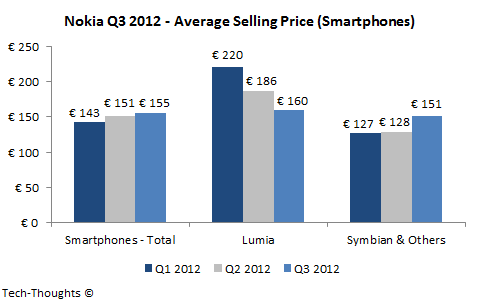 As the ASP trend indicated, Lumia gross margins are worse than those on Symbian smartphones. Lumia gross margins are also lower than those on Symbian models sold in Q3 2011, after the infamous "burning platform" memo. This really highlights the state of their current strategy. Increases or decreases to Smart Devices inventory related allowances may be required in the future depending on several factors, including future consumer demand, particularly related to our current Lumia products. This is really the clincher. Nokia seems to be expecting further demand related adjustments and sounds fairly realistic about the prospects of their Windows Phone strategy. 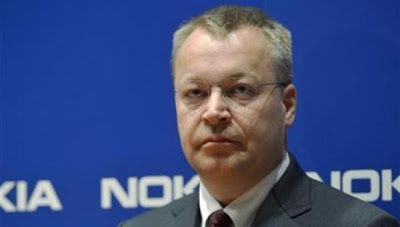 It looks like Stephen Elop is trying to buy himself some time, but at this point, Nokia's in too deep of a hole to be saved by a "white knight". 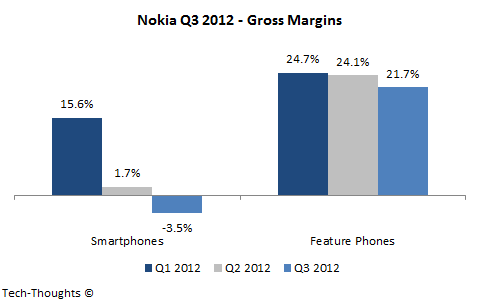 Conclusion - Nokia's Q3 results have really showed the failure of their current strategy. While their Q4 performance may be better, it is likely to be a temporary boost before another decline. It may be time for Nokia to unveil their contingency plans. There must be an intense research in the part of the itil release management to arrive with this stat. I personally like Lumia but for some people, there are far greater smartphones that are considerably cheaper.